Jewish Facts From Portland: Why The Need for Hamas to Bomb Israel? Hamas Palestinians in Gaza are now unified with Fatah Palestinians, known as the PA of Judea-Samaria . Hamas has been bombing Israel since 2001 and still they haven't stopped. In fact, now that they have unified, it's been stepped up. Why? Why was there a war in Gaza in the first place with Israel? Is Obama watching all this? Hamas called out the big O word; OCCUPATION. Charles Krauthammer asked, "What occupation? In 2005 Israel pulled out of Gaza. It dismantled every village, withdrew every soldier, evacuated every Jew and left nothing behind except the greenhouses where Jews had grown fruit and flowers for export. These were left as they were to help Gaza's economy. How about that? That was a Jewish decision. It was not appreciated, though. The Arabs trashed them when they took over. There is no occupation. Israel said its border with Gaza was an international frontier. They had renounced any claim to the territory and considered it an independent entity. At that moment Israel was actually creating the first Palestinian state. The other Muslims had never been that gracious to Palestinians. Those held in refugee camps were not considered citizens and have no rights and are not allowed to find work. No, that's because they're used as pawns to fight the Jews in Israel. Even the Ottoman Empire and the Egyptians who held Gaza before Israel had not done such a thing as give the Palestinians such recognition.. Sometimes I think my Israel is too good to people, but they did this because they wanted to live in peace. with these Arabs calling themselves Palestinians. The world had kept demanding that Israel give up land for peace, and they had done it successfully with Egypt. So they took the chance and it has failed. The Arabs turned around and voted in Hamas terrorists to rule over them. They turned Gaza into an armed camp and there has been war ever since. Any truce from Hamas, a hudna, has only been a tactic for giving themselves a rest to get ready for the next round. The problem is that Hamas says that all of Israel is occupied. They say that Israel is illegitimate. They tell everyone it is a cancer, a crime against humanity. Did they have to alter any of this in the peace talks? I doubt it. The big brother for Hamas is Iran. They are their arms supplier. Hamas' objective has been openly declared. Why hasn't the USA looked at it? Their goal is to liberate, destroy Tel Aviv and the rest of pre-1967 Israel. It is, as Charles said, it's raison d'etre. Jews were first attacked by Hamas with suicide bombings. That caused Israel to build a fence for protection. Hamas has come back with rockets that are fired indiscriminately at a civilian population in very populated areas. This started off with 150 rockets into Israel. Just 2 years ago Hamas was getting Fajr-5 rockets that were smuggled in from Iran that could reach Tel Aviv and Jerusalem. This puts 50% of the Israeli population in harms way. They get finances and political support from the other Middle Eastern states like Qatar who gave them $400 million, especially since the Arab Spring and the reversal in Turkey to a more Islamist society. Previously for the past 60 years, Turkey had been a friend of Israel. While Israel works to defend its population, Recep Erdogan called Israel a terrorist state. Is this eastern thinking compared to western? The best thing that has happened is that Egypt acted quickly and ousted the head of the Muslim Brotherhood from presidency. Morsi is out and Sisi is in. How Morsi ever got in in the first place is a mystery to me. They had been an outlawed group. Obama had them sit in the front row during his Cairo speech, though, so that recognition must have given them a leg up. Therefore, Egypt is still honoring it's peace with Israel. They even have worked together. There was a cease fire on November 21st in 2012, but we see that didn't last long. Over 500 rockets have been fired into southern Israel in 2014. On April 23, Hamas and Fatah united. The firing of rockets continues. I count at least 22 mortars and rockets have been fired since their unification. Why do they keep on pelting Israel? Their goal is to wipe out Israel. They don't want a peace. They want to destroy Israel. 3 rockets were fired from Gaza at the Hof Ashkelon and Sha'ar HaNegev Regional Councils, after rocket alert sirens sounded. No injuries were reported. Lots of mortar shells were fired at IDF forces on the Gaza boarder. No injuries, damages in attack. A rocket exploded in open field in Sha'ar HaNegev Regional Council. No reports of damages or injuries. In the Golan heights' area sirens were heard in several towns followed by explosions. It was assumed, that these rockets were not targeted to Israel but a result of the Syrian battle. A Syrian mortar shell hit the Mt. Hermon region, no injuries or damage were reported. At least two Syrian mortar shells land at the Israeli Golan. 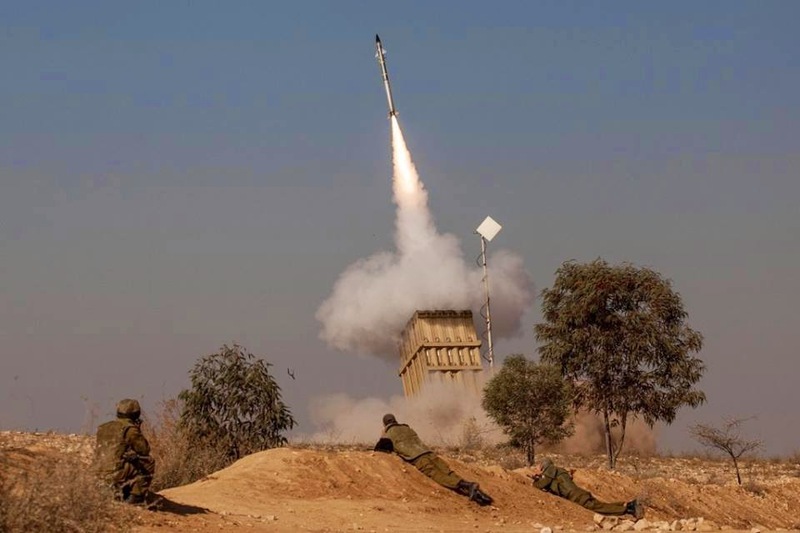 The Iron Dome missile defense system were activated, but were stopped, when calculation said, that the mortars would hit open field. Additionally, Syrians shot machine gun fire. The IDF believes, that the goal was not to hit the Israelian side, but celebratory fire from Syrian President Bashar Assad's forces. A rocket sent from Gaza narrowly missed a main artery in southern Israel as it landed in a nearby dirt field without causing any injuries. 2 of 3 rockets fired from the Gaza fell in the Hof Ashkelon regional council in the afternoon. No injuries or damage were reported. In Ashkelon a series of explosions were heard in the evening. 4 rockets were fired from Gaza, 2 of them were intercepted by the Iron Dome. Fragments of the rockets fell across the city. There were no reports of injuries or material damages. A rocket from Gaza landed in an open area in the Ashkelon area. No damage or injuries. This year Palestinians fired more than 500 rockets and mortars.